Click here for the Youth Referral Guide. The Community Youth Employment Program (CYEP) is a year round grant opportunity that provides education and on-the-job training opportunities to transition youth ages 16-24 into unsubsidized employment. 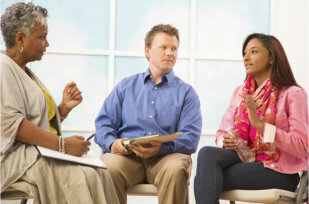 In an effort to foster healthy, safe, well-educated, and self-sufficient transition-age youth in Illinois, the Department of Human Services (DHS) is funding this year round program to provide eligible youth with educational enhancement opportunities, full and part-time job placements, and case management services to include life skills, counseling and work readiness for both in-school and out-of-school. The following information is provided for Youth on how to apply and for Employers seeking to participate in this program. This program is funded through the Illinois Department of Human Services. To apply for the CYEP, you must first have an Illinois workNet account. Click HERE to register for an Illinois workNet account. 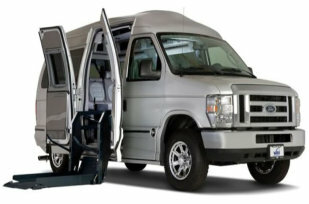 For assistance, contact us our office at (847) 360-7177. • Eligible youth will experience exceptional on-the-job training. • Eligible youth will receive an hourly wage stipend starting at $7.75 with fringe benefits. Have a chance to get a $1,000 scholarship paid to an accredited post-secondary college or trade school of your choice. 1) Come in and apply online at Employee Connections. 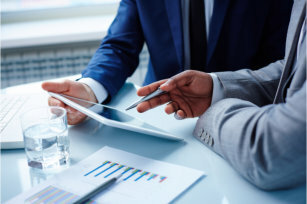 A Case Manager will assist you in the process. If you are an employer in Lake County, Illinois, and would like to participate in our program as a worksite, you must first complete an online Employer Worksite Agreement. To access and complete an employer worksite agreement, click here. Download and complete the agreement and email a signed PDF of the agreement to regina@myemployeeconnections.com. * December 6, 2018 12:00pm - Do to the Holiday season, this will be a conference call meeting. What I've learned allow me to take back to the office. The training delivery was exceptional and was worth the drive weekly. I enjoyed the caring and patient Instructor while reaching for success. To provide excellent training services in employment education to those we serve. To successfully bring about sustainable change in the lives of our Youth, Families and individuals by empowering them to achieve social and economic success through workforce skills, life coaching training and job placement services we provide. Copyright © 2017 - 2018. All Rights Reserved • Employee Connections, Inc. Employee Connections™ 10th Year Anniversary! 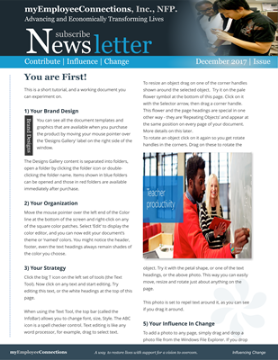 Find resources to help strengthen your communities, build collaborative relationships and receive the latest updates on other resources and articles. For In-school youth part-time employment opportunities or full-time employment opportunities will be provided during times when the youth are out of school. Eligible youth will be placed in age-appropriate, ability-appropriate, and experience-appropriate employment linked to one of the sixteen career clusters identified below. The youth's wage period cannot exceed 3 months (13 weeks). In-School youth are those youth actively pursuing their high school diploma or GED, or those enrolled in post-secondary education at least half-time. For Out-of-school youth full-time employment opportunities will be provided. Eligible youth will be placed in age-appropriate, ability-appropriate, and experience-appropriate employment linked to one of the sixteen career clusters identified below. The youth's wage period cannot exceed 3 months (13 weeks). In-School youth are those youth actively pursuing their high school diploma or GED, or those enrolled in post-secondary education at least half-time. Out-of-School youth are those youth that have already acquired their high school diploma or GED. NOTE: Out-of-school youth that are not actively engaged in pursuing their high school diploma or GED may still be eligible for the program. These youth must actively re-engage in the pursuit of their Diploma or GED. Participants must include documentation to support the above eligibility requirements as well as the following. Youth that have successfully completed their online application will be contacted by one of our staff to schedule a time for you to come in to our office with your proof of eligibility documentation. Youth who are selected to participate in the program will be assigned a program orientation date and time. 1) Work Readiness Training: These are short projects that provide training on the work readiness skills needed for employment using the Illinois workNet portal www.illinoisworknet.com In addition; work readiness activities may also include hands-on experience aligned with the identified Career Clusters. 2) Illinois workNet: All youth applications must be entered in Illinois workNet. Once the youth has completed an application in Illinois workNet, our case manager will verify eligibility. If eligibility is determined, the application will be printed out and the youth participant and case manager will sign it and maintain it along with the eligibility documentation in the youth’s file. The following tools available through the Illinois workNet will be required for all participants. 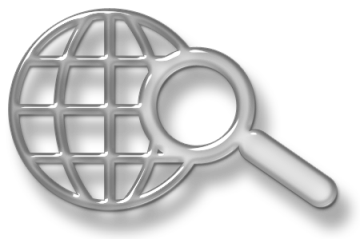 No search results found based on your selection. 1. Please download, save and complete the attached application. 3. Drop of your application at the following address. 2008 – 2015 107 high school juniors and seniors successfully completed our Student Connect afterschool job-readiness program which provided job-readiness training, life skills and job shadowing to juniors and seniors in the North Chicago, Waukegan, and Zion high schools. 2009 – 2014 Placed over 700 low-income and disadvantage youth and adult residents of Lake County, IL in subsidized and non-subsidized jobs. 2010 - 2011 Employee Connections was awarded a $275,896 grant to implement and operation the Put Illinois to Work Program for all of Lake County, IL. This program was funded by the Department of Human Service. 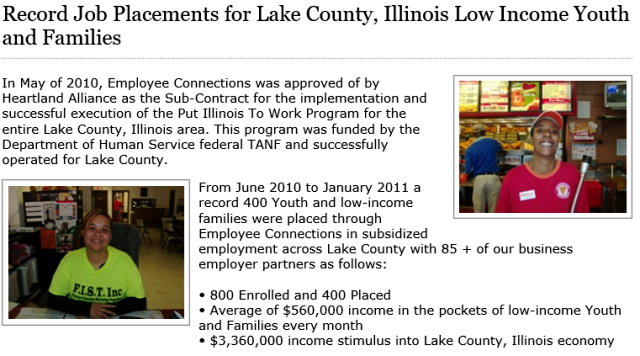 400 low-income Youth and Adult were placed through Employee Connections in subsidized employment across Lake County, IL making on an average of $1,600 a month per trainee-worker for nine months. 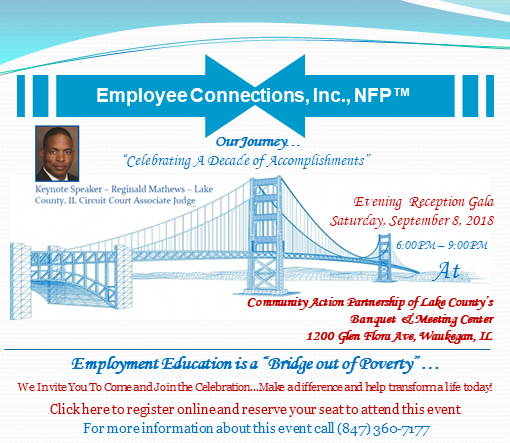 This amounted to roughly $5.5 million dollars in trainee-worker income from this program spent in Lake County, IL. This was a significant positive impact on Lake County, IL’s economy. 2011 - Received Bank of America Neighborhood Award in conjunction with the Black Chamber of Commerce of Lake County. 2011 - Received Black Chamber of Commerce of Lake County - Wreather L. Osorio Outstanding Entrepreneur of the Year Award. 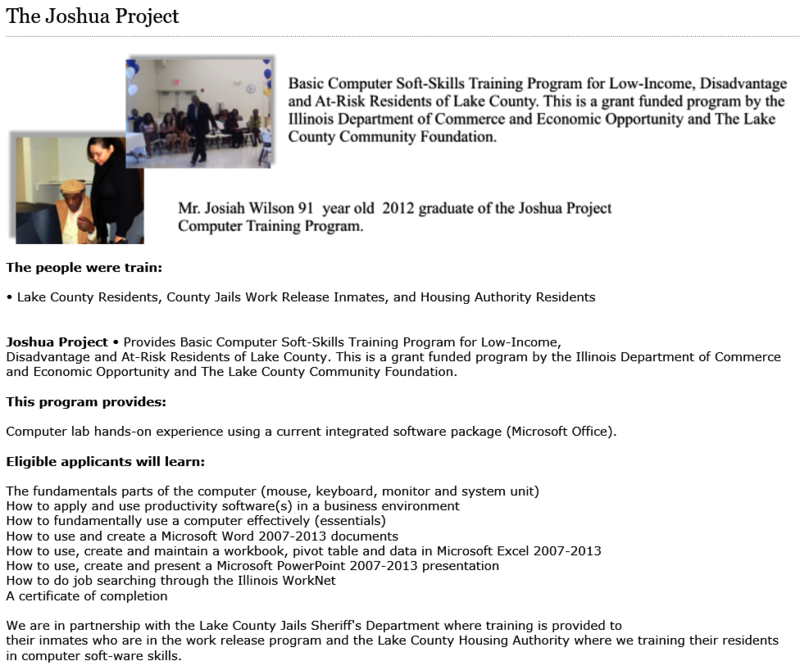 2011 – 2012 Awarded $49,600 for the Digital Divide grant from the Illinois Department of Commerce and Economic Opportunity Used for the “Joshua Project” – Computer Soft Skills Training Program. Over 250 program participants successfully completed training and graduated from the program. 2013 - 2014 Provided computer soft skills training for Lake County Jails work release inmates, Salvation Army Rehabilitation program residents, Waukegan Township clients and other low-income and youth and adults in Lake County, IL. 2013 – 2014 Providing Job-readiness and Life Skills training to participants in the Black Chamber of Commerce of Lake County’s Transportation Construction Apprenticeship Readiness Training, Referral and Intermodal Placement Program (funded by the Illinois Department of Transportation). 2013 -2014 – Awarded $530,000 in grants by the Illinois Department of Commerce and Economic Opportunity. 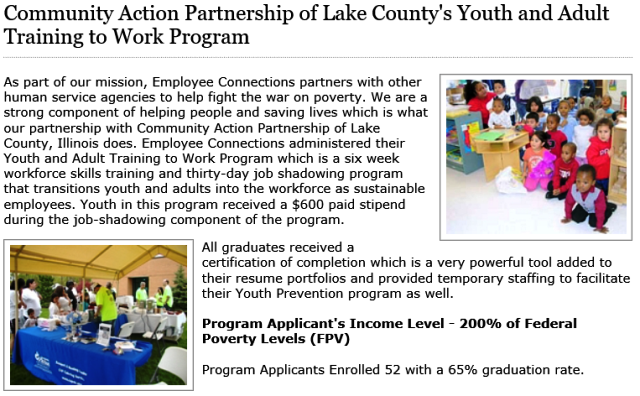 Grants were used to implement the SYEP Summer Youth Employment Programs for all Lake County, IL. 200 youth ages 16 – 24 participated in the program earning an hourly rate of $9 and working a 35-hour week for four to five months. All youth successfully completed the program and 15% of youth were hired after the program ended in permanent jobs. 2013 – 2015 Awarded a $146,970 in mini grants by anonymous donor to operation our small summer youth employment program. 62 youth ages 14 – 18 participated in the Mini 20 and Career Builders programs. Youth earned an hourly rate of $9 and worked a 25- 35-hour week for six to seven weeks. All youths successfully completed the program and two were hired on permanent after the program ended. 2014 - 2016 Employee Connections, in partnership with the Lake County Jails and Sheriff’s Office implemented an in-house computer training program for inmates. This training is provided inside the jail for groups of 15 or more inmates to go through a 5-week training program year round. 2016 - Received the Fuller Center, Hero Project - Working Families award. 2017 – Youth Job-Readiness to On-The-Job Training Program. Received $98,782 in funds from Illinois Department of Commerce and Economic Opportunity in Partnership with Community Partnership of Lake County to administer this program. 25 youth ages 15-24 successfully completed the program 20% of youth transitioned from subsidized to unsubsidized employment. 2017 – Manufacturing Construction Internship Program Recruitment Project. Damarea Sims, age 21, one of the MCIP candidates we recruited, also participated in our 2015 job placement program. Damarea successfully completed the MCI program and was hired as a full-time forklift operator at AzkoNobel. During his 8-week internship, Damarea walked to class and to his internship worksite every day, a 10 – 11 mile round trip walk. Damarea was considered an outstanding youth participant in the program and now is an outstanding employee. Damarea no longer has to walk to work. He now has a car and is making $15.00 per hour. 2017 - 2018 – Community Youth Employment Program: Awarded $278,847.00 by the Illinois Department of Human Services to implement a CYEP program for 50 youth. As of 4-1-18, 35 youth have been placed in subsidized employment and 15 more youth are on schedule to be place by 5-1-18. Youth are on schedule to transition from subsidized to unsubsidized full or part-time employment on or before their 13-week on-the-job training ends. President/CEO Meeting Essentials By D'esign, Inc.
• Adult Youth Employment Program is designed for at risk youth from low to moderate income families between the ages of 16 to 24 in-school youth and out-of-school youth. The core components of this program include the development of "real life" skills, social skills, academic enrichment, job readiness training and self-worth and on-the- job training experience. • Candidate Referral Program - This is a job placement program where local area employers contact Employee Connections to refer employment age youth and adults that have successfully completed one of our programs, to them to interview for employment opportunities. • Career Builders - This is our Summer Youth Employment program that is designed for at risk youth from low to moderate income families between the ages of 14 to 17 in-school youth. The core components of this program include the development of "real life" skills, social skills, academic enrichment, job readiness training and self-worth and on-the-job training experience. Youth are provided a stipend as well. • Life Skills and Work-readiness Training - With our Youth and Adult Employment Education and Training programs we offer: Job Readiness Training and life skills training that prepare participants for employment and how to sustain their jobs once hired. It covers: Preparing a resume, job application, cover and thank you letters, career exploration, interviewing skills, job seeking, work place expectations, behavior on the job, being reliable and on time, financial accountability and budgeting, appropriate attire and conflict resolution. • Student Connect - This is an after school Work-readiness training program for High School Juniors and Seniors. Students are trained in job readiness skills to prepare them for them workforce. This program develops partnerships for training and development and job placement opportunities for the student participants. • Summer Youth Employment Program (SYEP) - This program is funded by the State of Illinois. It is administered by Illinois Department of Commerce and Economic Opportunity and Department of Human Services. It provides on-the-job training and experiences. Low-income and at-risk youth are eligible to participate in the program. The program pays youth at $9.00 hourly wage for a 35-40 hourly week for six weeks. Youth are required to also take the Illinois workNet® work-readiness assessment and received their certificate of completion before being placed on a worksite. • The Joshua Project - Computer Skills Training Program is free to low-income, low-skilled disadvantaged youth and adults. 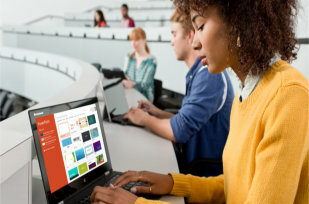 The program provides an introduction to concepts addressing basic computer hardware application of Microsoft Word, Excel and PowerPoint software.